Originally uploaded by faster panda kill kill. 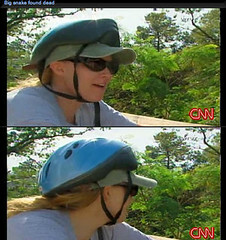 If you get interviewed on CNN about finding a big snake on your bike ride, be sure your helmet isn’t on backwards for the entire nation to see. The big bulbous part goes toward the rear of the head. If there’s a visor on your helmet, that goes toward the front. I know somebody, by the way, who recently fell from his bike after hitting a rabbit and nearly cut his nose off from the broken plastic visor. Be sure your straps are adjusted so that they’re snug but not too tight. The helmet should be level across your head, not tilted way up high so your forehead is exposed. If you have children, inspect their helmets and straps for correct wear. Admonish them also to remove their helmets when they’re off the bike — kids have suffocated when their helmets get caught on playground equipment. Death by bike helmet strangulation is a really ironic way to die.